A shower door adds to the beauty of your bathroom, however, with all that moisture and humidity, they also tend to get pretty dirty. If you don’t clean them atleast once a week, they become dull and dirty. Don’t want that happening right? Time to start cleaning shower doors! GSR’s cleaning team is back once more with some helpful cleaning tips for you. 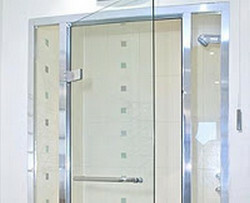 There are recommended ways to clean glass shower doors that will maintain its sparkle and shine. The best recommended product for cleaning shower doors is Ajax Professional Ultra Bathroom Cleaner. Comet has developed a spray on a liquid that is non-abrasive and is especially used for glass, vinyl, and metal components of a shower door. It is a liquid spray that is easy to apply and wipe off, however, you need to give the product time to work, especially if soap scum (a heavy buildup that comes from the talc in bar soap) is to be removed from the shower door. P.S – If you want to avoid the formation of soap scum because of the soap bars, then it’s better to use liquid soaps. Safe and easy to store. Another important cleaning technique for shower doors is to squeegee after showering. It removes excess moisture from the shower and avoids water spots that can be difficult and almost impossible to remove. A plastic squeegee is a shower door’s best friend, and should be included in any bathroom cleaning kit.Do not use the metal squeegee as that could damage the shower glass and create scratches. A shower door should be cleaned weekly to maintain optimum cleanliness and shine. Frequent cleanings and use of the squeegee will reduce the need for heavy cleaning and scrubbing. The longer you keep a shower door uncleaned, the tougher it will be on you. So, in order to keep your shower door looking as good as new, maintain the cleaning routine and use recommended cleaning products. It’s not enough to just build a beautiful bathroom. You need to maintain it and keep it clean and sparkly because this is the place where you find the most relaxation. It should be germ free, mold-free and grime-free! The best part about a brand new shower enclosure is that they can fit all of the modern styles that are coming up now with new homes being developed, see through glass doors are the prettiest in my opinion.